It's worth planning your vacation to Africa around the top festivals and events. Music, food, and processions mark Ethiopia's biggest festival. The origin of the Feast of Epiphany dates back over 1000 years and once the ceremonials are over it's time to shake your hips and join in the vigorous dancing. The best places to enjoy the festival are Gondar, Lalibela and Addis Ababa. It is worth joining a tour, just to make sure you get a hotel room reserved. It's also good to have a guide who can tell you exactly what is going on during the processions. Check out Wild Frontiers and Wilderness Travel for tours. Local Ethiopian tour operators can also help you. Three days of traditional Touareg art, music and dance takes place in Essakane, 2 hours from Timbuktu, Mali. International acts from Europe and West Africa round out the festivities. Everyone camps in the desert with their camels close at hand. A truly unique cultural event that is well worth the trek. It's worth taking a tour as in the past few years there have been some safety concerns. In 2015 the organizers are doing their best to find a safe spot in the Sahara to hold the festival. Check the official ​website for updates. The Panafrican Film and TV Festival of Ouagadougou (FESPACO) is Africa's largest film festival and has been around for over 40 years. The festival is held every two years in Burkina Faso's capital. While there is some glitz and glamor during the opening and closing ceremonies, the film festival is actually held in eleven dusty cinema halls throughout Ougadougou. In 2009, Ethiopia born director Haile Gerima won the coveted Best Film prize for his movie Teza and received the Golden Yennenga Stallion, Fespaco's equivalent of the Oscar statuette. Southern Africa's biggest jazz festival is held annually in Cape Town, South Africa. Jazz legends from all over the world perform for just two days at the convention center. More than 30,000 people have attended past festivals, so advance ticket purchase is absolutely necessary. This wonderful spiritual festival, held annually in Fes, allows you to bump into whirling dervishes from Iran as well as mystics, chanters, and dancers from all around the world. A festival celebrating the local culture of Fes is held concurrently. Both festivals allow visitors a wonderful insight into traditional life in the old walled city. Sip some mint tea, enjoy Sufi chanting and of course all that delicious Moroccan food. A music festival based on the traditions of Gnawa music has grown to include musicians from all over the world. This successful annual festival has been around for a decade and venues are dotted all around the picturesque town of Essaouira. There's a tour if you would like to join in the fun as a group. Gnawa music is a combination of acrobatic dancing as well as music. Its origins lie in a unique mixture of Berber, African and Arabic songs, religious rites and dance. This festival is East Africa's premier cultural event and it takes place annually on the historic island of Zanzibar. You can enjoy music, arts, literature, film and more, from all over Africa and countries bordering the Indian ocean. Dhow races take place throughout the festival. An excellent tour is available through Zanzibar Festival Tours based out of London. They're offering a 10-night package, front row seats to all the events, and first-rate accommodation. Ramadan refers to the 9th month in the Muslim calendar. All Muslims are expected to fast during the day for the entire lunar month. During the month of Ramadan, Muslims abstain from food, drink, and other physical needs during the daylight hours. As a time to purify the soul, refocus attention on God, and practice self-sacrifice, Ramadan is much more than just not eating and drinking. Fasting during Ramadan is strictly adhered to in countries where there's a large Islamic population. Muslims account for over half the population in as many as 28 African countries. The end of Ramadan is marked by the festival of Eid and celebrations last for several days. Meskel is an old Christian festival that has been celebrated in Ethiopia for over 1600 years. It commemorates the discovery of the cross upon which Jesus was crucified. Some pieces of the cross are thought to have been brought to Ethiopia, hence the celebrations. In Maskal square, in Addis Ababa, a colorful procession of priests, deacons and choir singers walk around a huge pyre, bearing ceremonial crosses and wooden torches decorated with olive leaves. The torch-bearers move forward in unison to set alight the slender pyramid-shaped structure, topped with a cross made from daisies. The next day people go to the bonfire and use the ash make the sign of the cross on their foreheads. On the edge of the Saharan desert, the Touareg and the Fulani nomads used to come together once a year for a week. 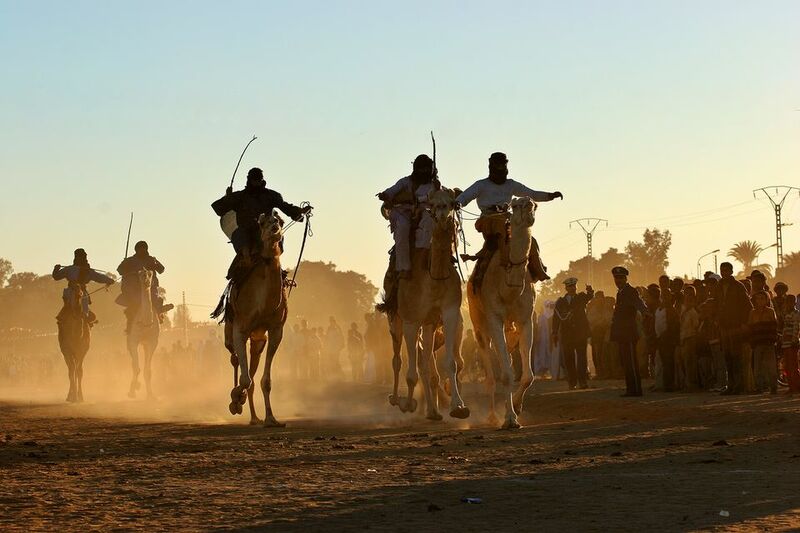 They would dance, make music, men dress as women, women dress-up and they race their camels. The event was known as the 'Cure Salee' and was one of the most unique and colorful cultural happenings in the world. Today, the Wodaabe are staging a separate festival to avoid the tourists and commercialization that has been creeping into their celebrations. You can join a tour to enjoy the Gerewol. Check out the YouTube video of the festival. Attracting more than 50,000 people, this annual festival celebrating the culture of the Sahara desert is quite a spectacle. The festival takes place in the heart of the Tunisian Sahara in the small oasis town of Douz. Originally a Bedouin marriage market, the festival is now a four-day affair filled with singing, dancing, feasting and camel racing. There's an excellent craft fair and lots of time to mingle with nomads from the surrounding areas as well as French tourists. How Do People Celebrate New Year's Eve in Africa?